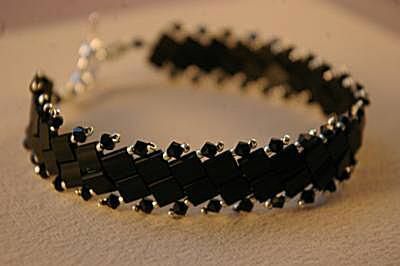 You can adjust the size of this bracelet by adding or omitting rows of Tila beads. You will need to adjust the number of Swarovski crystals accordingly, as well as the amount of Tila beads used. Cut a comfortable length of beading thread, about 5 feet. If using nylon beading thread, condition it and stretch it. Pick up 2 Tila beads. Pass through the same hole of the first Tila bead again so that the two beads lie flat against one another. Push the Tila beads down the thread until they are resting against the stop bead. Pick up a Tila bead. Stitch across the bead and down through the second hole of the bead, and then down through the hole of the second Tila bead from the first row. The new Tila bead should be centered between the two Tila beads from the previous row. Pass needle up through the second hole of the second Tila bead from the first row. You are now in a position to add the second Tila bead. Pick up a Tila bead. Pass needle down through the second hole of the bead added in the previous step, and then back up through the bead added in this step. Optional Step: You can reinforce the new bead by repeating the thread path by going back through the first bead added in the second row, the bead below it, across the bead, and back up through the bead you just added. Pick up a Tila bead. Secure it by passing through the second hole, down into the hole of the Tile bead beneath it, up through the next Tila bead, and back up through the bead you just added. The new Tila bead should be centered between the two beads of the previous row. Pick up a Tila bead. Stitch down through the bead beneath it, stitch across, and then up until you are exiting the bead added in the previous step. Stitch down through the bead added in this step, and back up through the bead added in the previous step. This will secure the beads together and prevent any gaps between them. Continue to stitch the base of the bracelet, adding two beads per row, until the base reaches the desired length. To figure out the desired length of your bracelet, take the finished length and subtract the length of the clasp plus 1 inch. Each Swarovski crystal is added in a tiny fringe as an embellishment along both edges of the bracelet. When you have reached your final row, weave so that the thread is exiting the outside hole of the last Tila bead. Pick up 1 size 15 seed bead, 1 Swarovski crystal, and 1 size 15 seed bead. Skip the last seed bead added, pass back through the Swarovski crystal and the other size 15 seed bead, and back into the Tila bead. To get into position to add the next embellishment, stitch across the Tila bead and then through the outside hole of the next Tila bead. Work the embellishment on both sides of the bracelet, stitching across the Tila bead on the other end in order to get into the correct position to continue embellishing the second side. Pick up 2 sizes 15 beads, 1 Swarovski crystal, 7 seed beads, one-half of the clasp, and 7 more seed beads. Skip 12 seed beads and pass the needle back through 2 seed beads, the Swarovski crystal, and 2 seed beads. Stitch through the other centermost Tila bead hole, across the two Tila beads, and back through the hole you were exiting at the beginning of this step. When adding the bar end of the toggle clasp, make sure that the loop is loose enough and large enough that the toggle can easily pass through the loop. You may have to add or remove beads as necessary. Repeat the thread path twice more to secure, then weave back into the beadwork, tie a knot, weave in a bit more, and then trim your thread close to the beadwork. Repeat for the other half of the clasp. The finished Elegant Tila bead bracelet.